The smell of freshly cooked bread wafting through a house is perhaps one of the most comforting aromas. I am sure everyone would agree. But, have you ever been lucky enough to have the smell of chocolate bread with home made chocolate spread wafting through yours? To me chocolate and bread sound like the perfect match so why isn’t chocolate bread a widespread thing?! Afterall, the French have ‘pan au chocolat’ and everyone will remember having chocolate bread and butter pudding at least once in their childhood, but yet actual bread that is made of chocolate hasn’t quite caught on yet. My boyfriend and one of our friends was meant to be coming to stay this weekend and we were all going to go and see a football match today. Unfortunately it was cancelled due to a frozen pitch. I had cooked the chocolate bread on Friday, thinking that it would be the perfect breakfast warmed with the chocolate spread on Sunday morning, but our friend decided to stay back in Stevenage. Luckily for Jon this meant he got the chocolate bread all to himself! 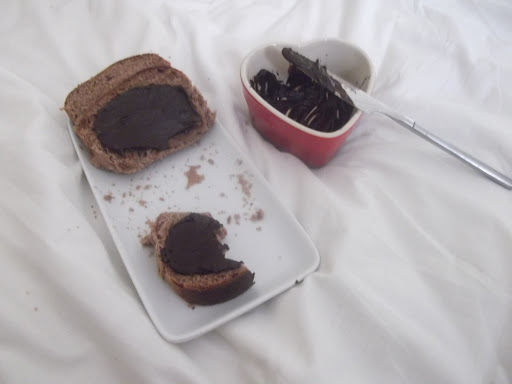 I think Chocolate Bread with Chocolate Spread would be the perfect way to wake your loved one up on Valentines Day too! Why not shape the loaf into a heart shaped tin instead of a standard loaf tin! If my man brought two big slices of this to me on Valentines Day I would be very impressed! The dark chocolate gives the dish sophistication and depth of flavour, yet at the same time the thought of a warm slice of bread gooey with chocolate spread has a lovely innocence that sends you back to your childhood! Delicious! Serving Size: 1 loaf of bread and plenty of spread! In a large bowl mix together half of the flour, cocoa powder, sugar, yeast, oil and all of the water. Once it has all come together slowly start adding in the remaining flour until a soft ball of dough has formed. Knead the dough on a surface that has lightly been dusted with a mix of flour and icing sugar. Do this for at least ten minutes until the dough feels springy and elastic. Grease a bowl and place the dough ball inside. Put a tea towel on top and leave the dough to prove in a warm place ofr an hour or until the dough has doubled in size. Once it has risen, knock the dough back and knead for another five minutes. Place the dough into a lightly greased tin and bake in the oven for 30 minutes or until the bread sounds hollow when you tap its bottom. Tip it out of its tin and leave on a wire rack to cool. In the meantime, melt the dark chocolate over a pan of hot water. Once completely melted take off of the heat and leave to cool slightly but do not let it set. Add in the marscapone and stir until smooth. Use the spread on thick slices of your warm chocolate bread. I have entered this as part of ‘Simply Food’s’ Lets Cook for Valentine Chocolates / Hearts Event (1st Feb – 29th Feb) You should enter too! Click the event name above to find out more! It looks really tasty. since you have used chocoate it would be perfect to send to lets cook for valentine chocolate/ hearts event@ simply.food. Do lonk it up asits a lovely recipe. Thank you for linking this awesome recipe. I'm glad you stumbled across it! It has to be one of my favourite recipes in the whole wide world 🙂 real comfort food!